A 4 post sail is a very effective design. This hyper shape design offers aerodynamic qualities in high winds. Colours are Terracotta and Desert Sands. Posts offer total independent anchor control and balancing of the generated stress loads. Hyper sails must have more than 3 sides and can have any number of posts. This large hyper sail is situated in a windy environment in the Perth hills. It has 7 posts for stability and a slight flap for extra shade. 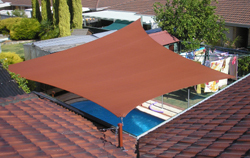 Gable sails provide cost effective cover to larger areas without reverting to fully framed hip and ridge structures. A typical feature is the high opposing posts on centre. Posts are made from galvanised steel and powder coated to your choice of colour. They can be designed in many shapes. This project has curved white posts attached to a balcony. 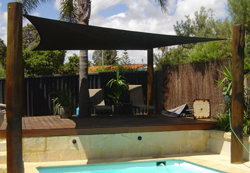 Other materials can be used for posts, eg trees and recycled jarrah telephone poles. The choice depends on their load strength, size and position. Combination of posts and engineered wall anchors can also be used. Wall anchors are only used where the fixing point is appropriate and will hold the sail stress load. This example is a combination of posts, wall anchors and roof masts. Another example of the combination of posts and roof and wall anchors. The roof masts are engineered according to the size of the sail. Another example of roof masts combined with posts. Colours are Charcoal and Mulberry. 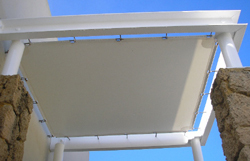 Proper positioning of roof mounts can increase the amount of shade provided by a sail. A straight edged track is used to fix these sails to the wall. Colours are Terracotta and Silver. Tracks can take on different shapes. They bring the edge of the shade sail hard up to the building. This sail has a track attached to the patio frame. This track is attached to the outer side of the balcony frame. 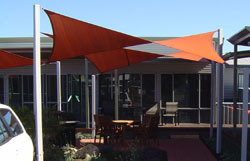 Shade Sails can cover a pergola (either below or on top of the structure). This flat sail uses tensioned PVC. A sail can cover a hip and ridge structure. This is a carport water proof PVC sail structure. 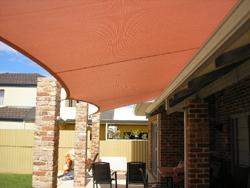 We have many different carport designs. 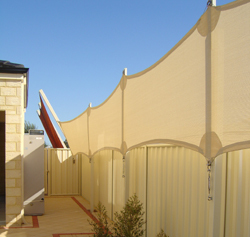 These sails have been used as privacy screens as well as to provide shade. 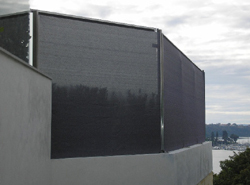 Another example of a privacy screen. Go to the Gallery Section for more examples.